Oszczędź $17.00 wybierając tę opcję już teraz. Add/copy/manage combination(s) for your product(s). 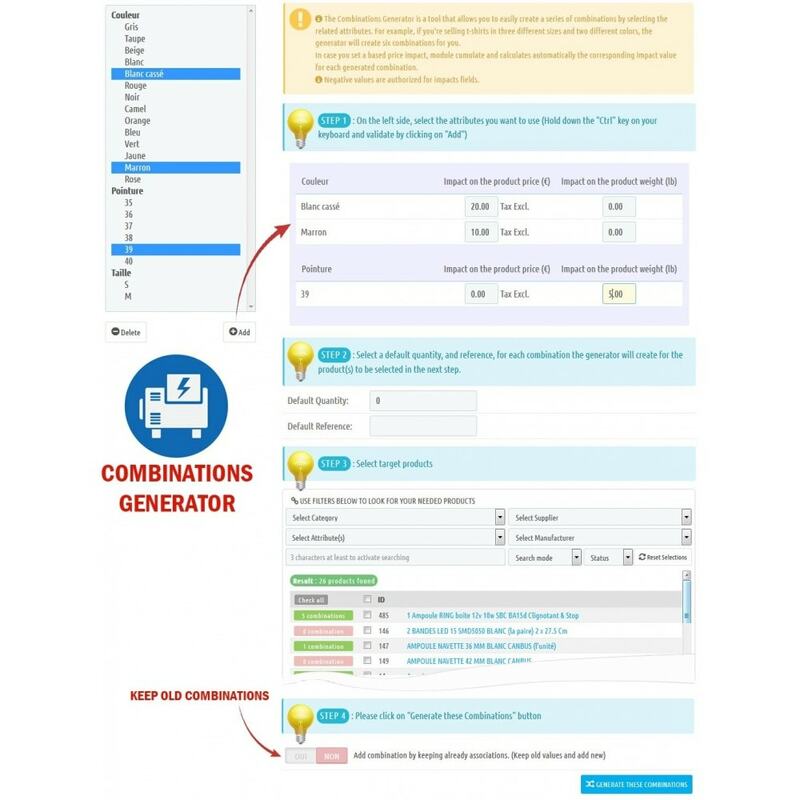 Generate a series of combinations for your product(s) using our GENERATOR. 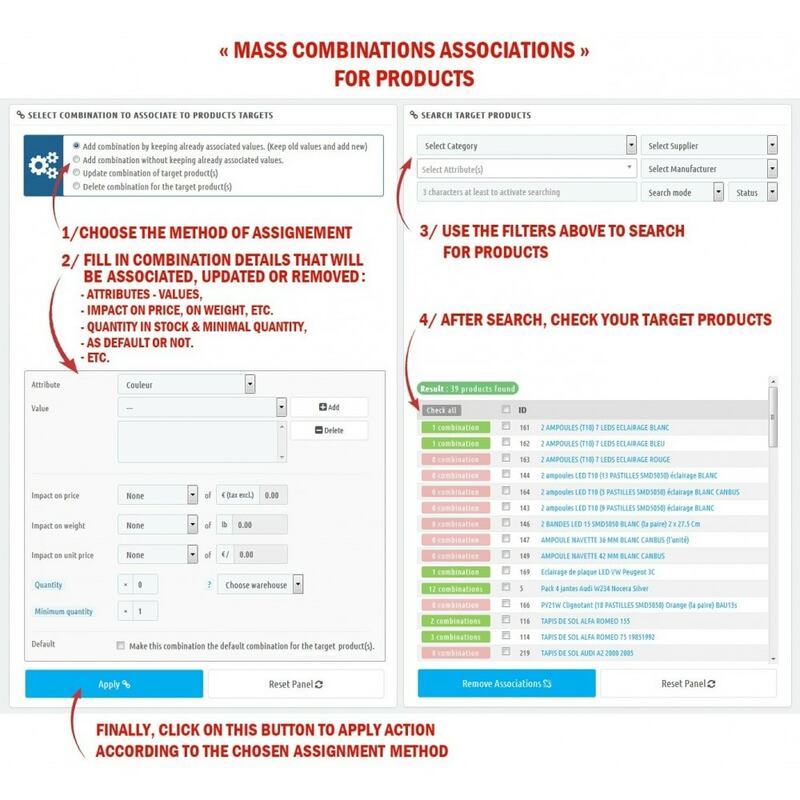 Cumulate and calculates automatically the impact price value for each generated combination. Maximize visibility of your products in your store. The benefit for your customers is an always well organized online shop. 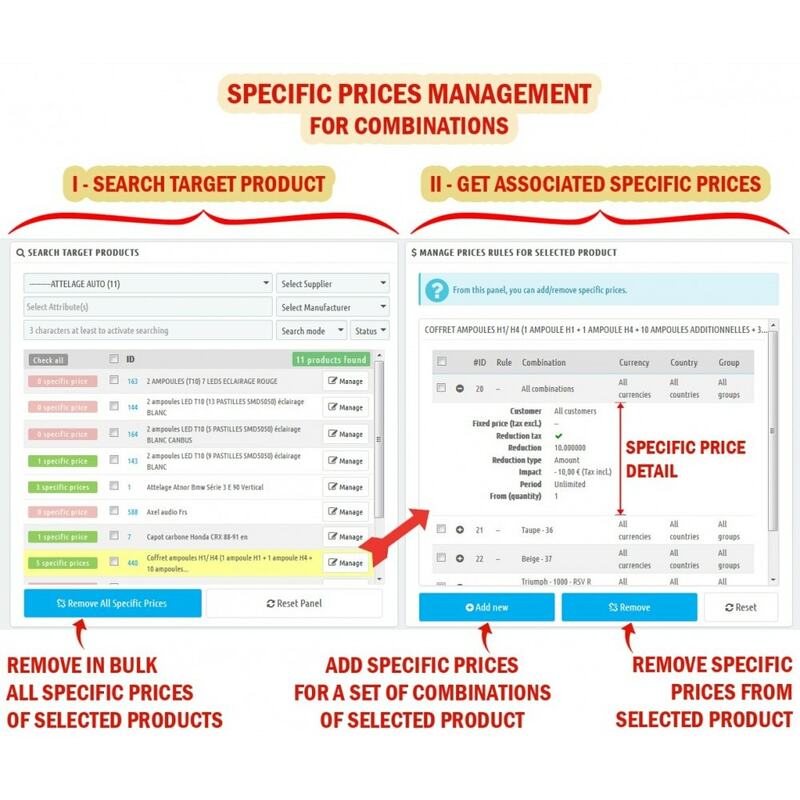 Don't spend hours browsing between each product to manage combinations (Help saving time)! Easy product selection through intelligent filter. 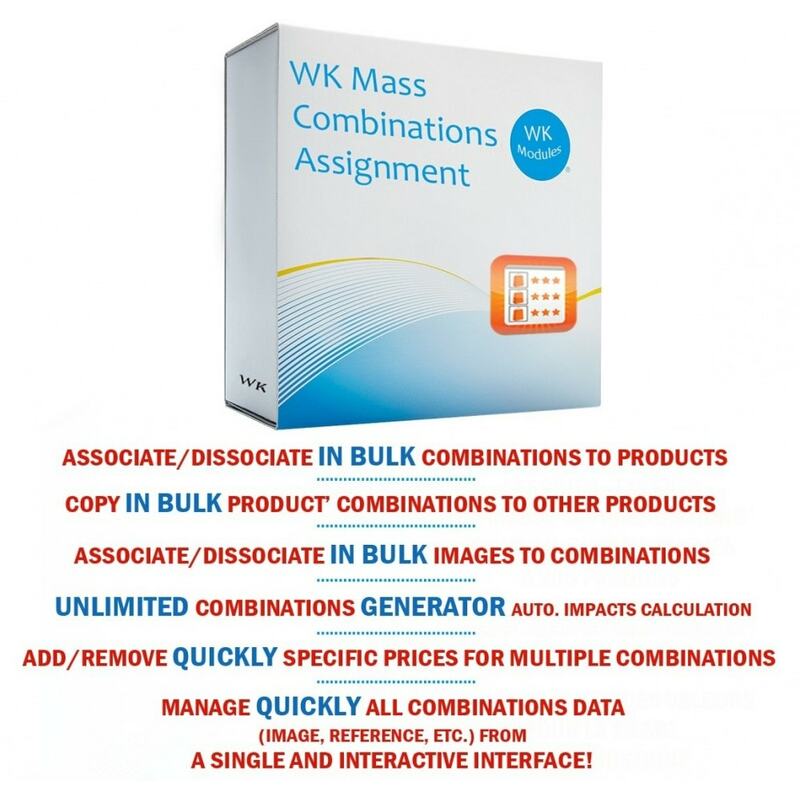 Associate massively (bulk) combinations to selected products. - Add combination by keeping already associated values (Keep old values and add new). - Add combination without keeping already associated values (Remove old values and add new). - Update combination of target product(s). - Delete combination for the target product(s). 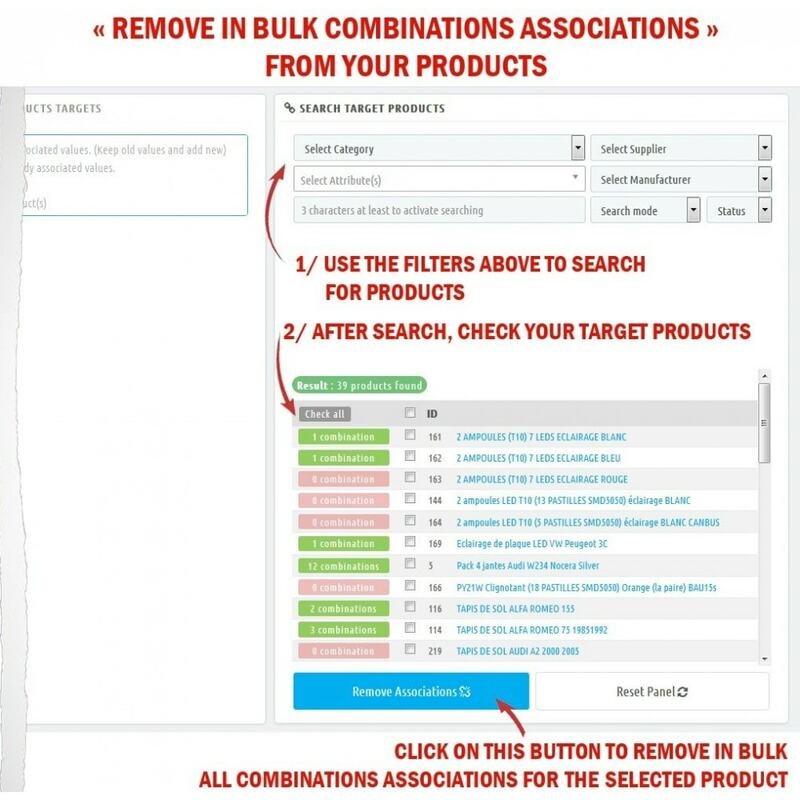 Remove easily and massively (bulk) combinations associations from selected products. Set price impact, weight impact, unit price impact, minimal quantity and warehouse (if advanced stock management is enabled). You can save time by setting quantity for the selected combination. Mark the added combination as default for target products. Replace combination by another one without loosing related data (reference, EAN13, impact price, etc). Generate and create a series of combinations for your products. Cumulate and calculates automatically the impact price and the weight for each generated combination. You can enter impact prices with tax, without tax or in percent. Define a default reference and quantity for the generated combination. Ability to add combination by keeping already associations. The generation process could generate thousands of combinations while avoiding the most common PHP errors that can occur during long processes namely the Timeout and memory limitation issues but beware the generator is not unlimited and will remain always slave to server performances. 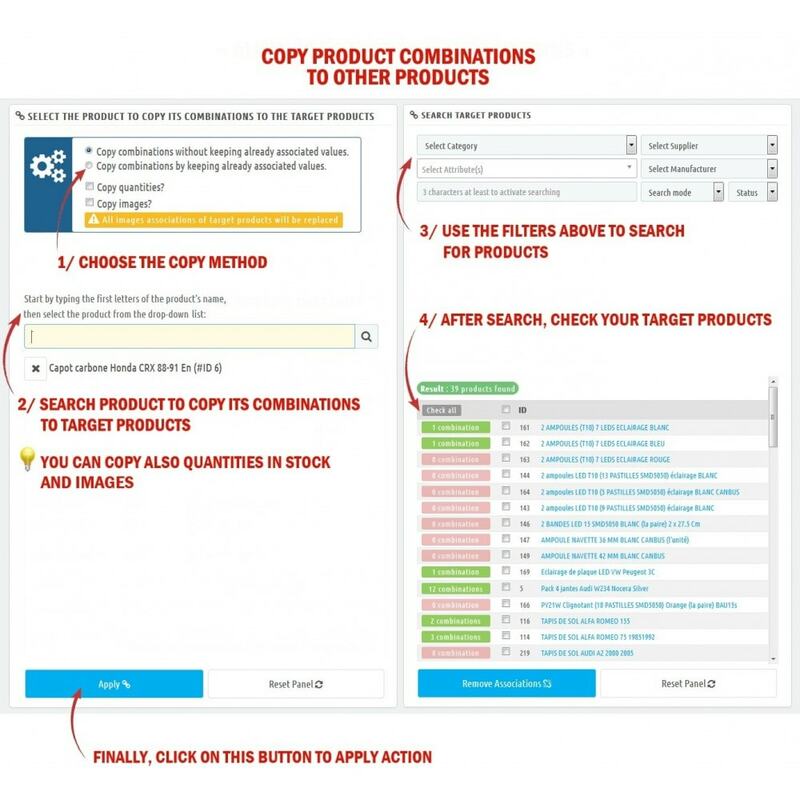 Copy quickly product combinations to others products. - Copy combinations by keeping already associated values. - Copy combinations without keeping already associated values. Copy also quantities and/or images (optional). 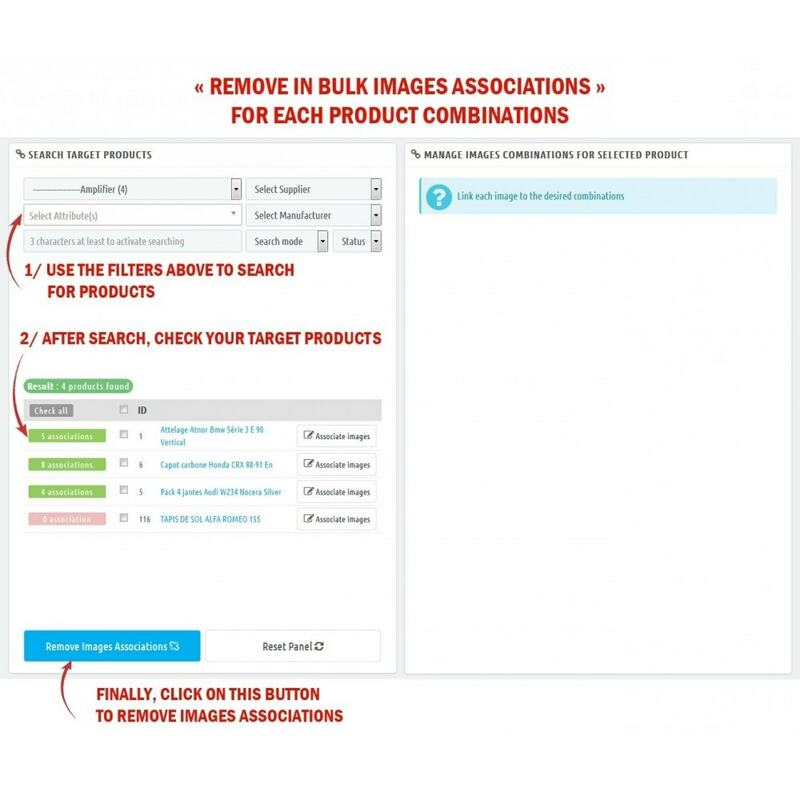 Associate quickly and Massively images to selected product combinations. Remove Massively and quickly images associations from combinations. 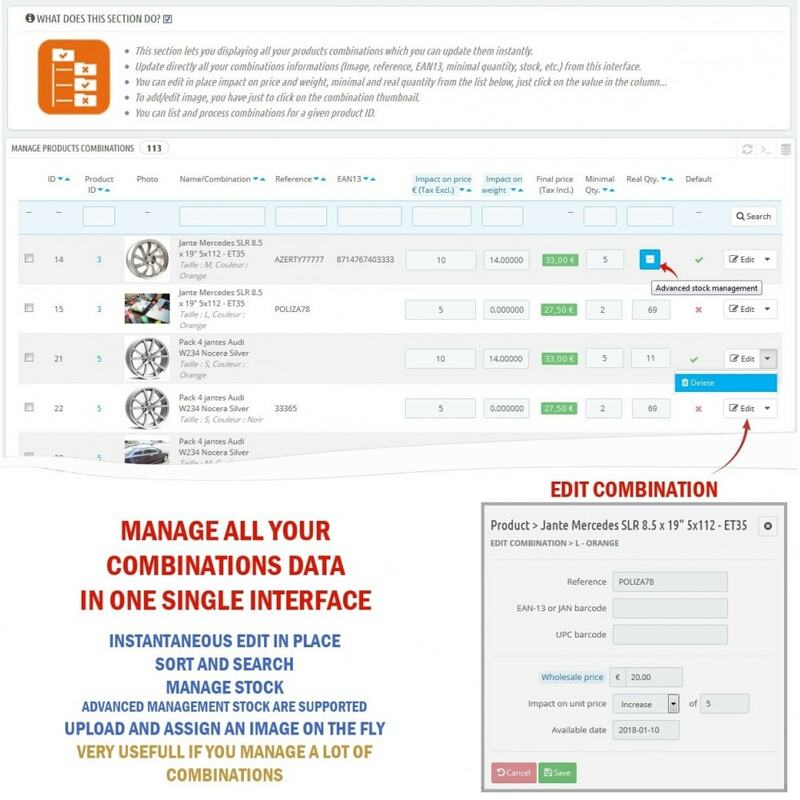 Manage all your combinations data quickly from a single and interactive interface. Useful if you have a big number of combinations to manage. Sort and search list by name, reference, EAN13, etc. ; Display only out of stock combinations. Edit in PLACE the image(s), reference, EAN13 code, impact on price and weight, minimal quantity, stock, etc. for each combination. Control your stocks by searching combinations that minimal quantity to buy has been reached. 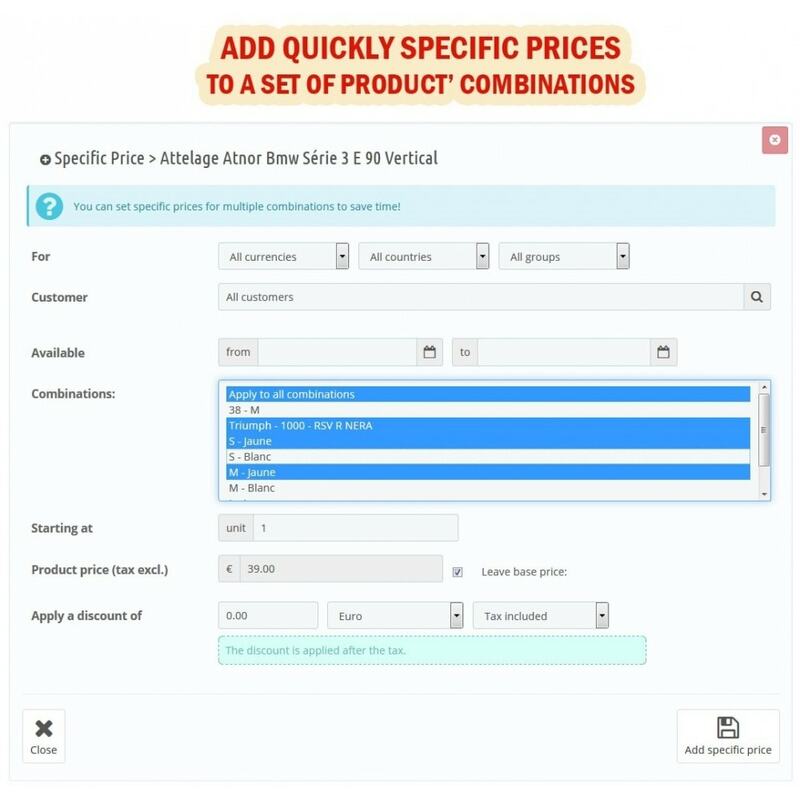 Add specific prices for a set of combinations of selected product. Remove quickly specific prices from selected product. Remove in bulk all specific prices from selected products. 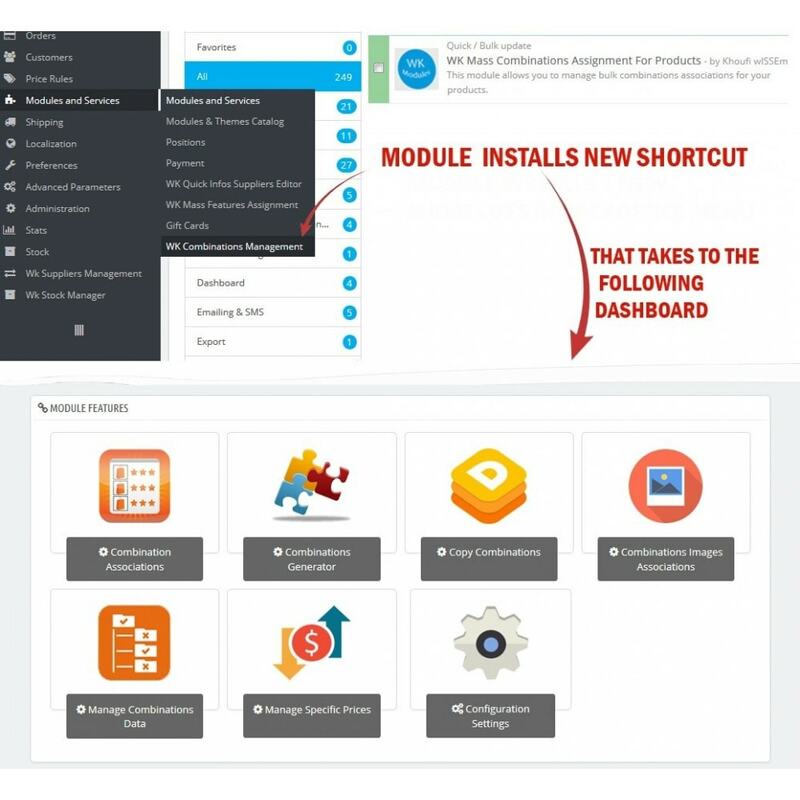 Advanced stock management features are supported. Available quantities and physical quantities can be updated in different warehouses. No any database tables installed or modified and no overrides are used. We have implemented an advanced and multi-criteria search engine to help you easily find your target products to be associated or dissociated. We give you ability to filter results by Keywords (boolean search), product statuses, Categories, Manufacturers, Suppliers & Attributes. 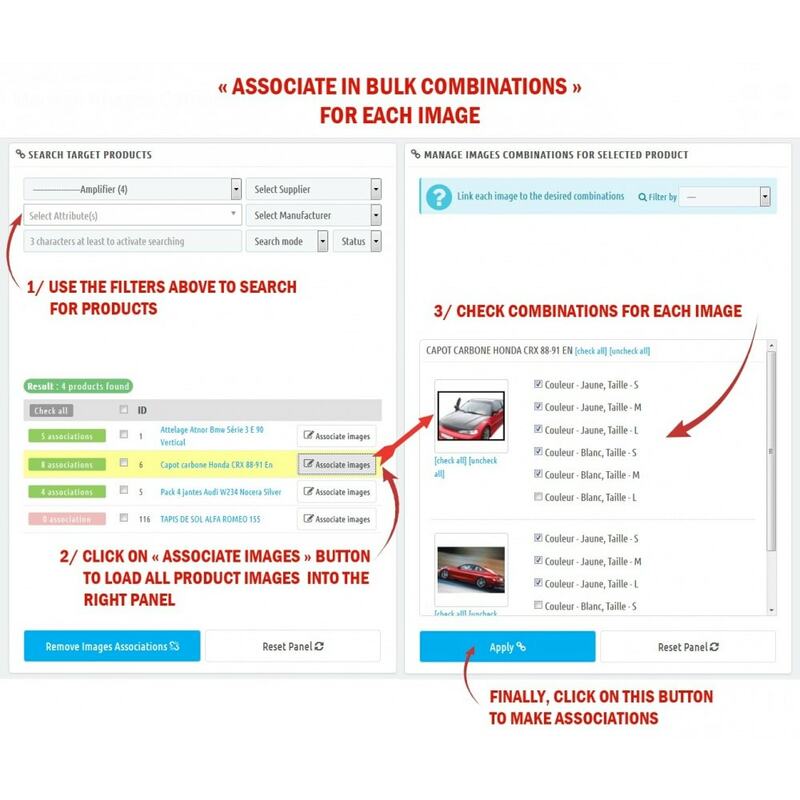 Direct access to product sheet to verify combinations/images associations. This module allows you to facilitate, accelerate and simplify bulk stock, wholesale and retail prices update of your store by processing internal and external suppliers files import. If you have any questions or problems with the module, click “Contact the developer”, we respond very quickly and will do everything possible to solve your request as soon as possible. Add ability to choose how to update combinations. Add ability to choose how to remove combinations. Add ability to search products by ID. Improve codes & Fix some minor bugs. Add compatibilities for Prestashop 1.7.5 & PHP 7.2.